Why dat man take my floor? I will have more about this in the weeks to come, of course. 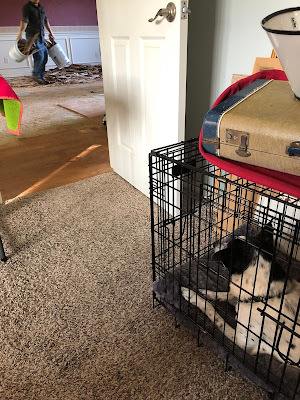 We still have one more room to pack up for the renovation, plus we need to dust our living area, which consists of the master bedroom and bathroom. Dusting will be a feat unto itself as we have crammed so much into this area, but the grit is pretty bad, despite our door having been sealed during most of the demolition. It has to get worse before it can get better, so we are living with the worse right now. Oh, and I wasn't kidding about having hot dogs for Easter dinner - something that requires little-to-no prep and clean up is exactly what we need. That, some store-bought potato salad, and a Cadbury Creme Egg for dessert...it'll be an Easter dinner to remember! Ugh...that renovation stuff is painful! but the end result is so worth it. That's a fun family memory! I just realized I packed the grill tongs SOMEWHERE. I think we can quickly turn/remove the hot dogs with a plastic fork...stay tuned to see if we have melted plastic hot dogs, LOL! There is that point in renovations where it's too late to turn back, but then you think "Ugh, what did I get myself into!!" Construction dust is the worst. The best part is seeing the changes each day, though. YES. And yesterday I saw a new 3-gang light switch in my kitchen, and the wiring ready for the under cabinet lights, and thought PROGRESS. Today ended up not being a quiet day; plumbers showed up and are installing the bathtub in the hall bathroom, so there's another sign of progress! Oh boy! This is going to be fun. I think I left several times during the worst parts of the renovation! I do remember one time being on my way home, and Jay calling and saying that my bed was not back in place yet. I think I just stopped somewhere and stayed overnight one more night! I can hardly wait to see all the changes! I needed to be here this week as there were a lot of questions that I was able to readily answer, but oh man...the dust is BAD. Looking forward to seeing the changes to your house. Happy Easter Shelley to you and yours. Are you replacing all your floors too? I hope you have a nice Easter even if you are eating hot dogs! Yes we are, which has caused a lot of the dust with getting all of the old flooring up. But wait, there will be more dust with drywall repair, woohoo! Sounds like the perfect Easter dinner to me!!!! OMG THE DUST!!! Gawd, it takes forever to clean up and you think you got it... then there is more dust there. Sigh. Totally worth it though. I can't wait to see pics and hear all about it. And hope all the fur babies have a chill weekend (and the humans too)! The dust is so sticky, if that makes sense. Like no other dust I've experienced. I'm sure this will be an Easter you remember. It's going to be worth every melted plastic fork.